Pots de Fromage (cross between cheesecake and custard) with macerated berries, honey comb, cinnamon streusel and more. About: Aaron worked for Marcus Lalario in Seattle music clubs, then worked at Crystal Mountain’s Summit House. He traveled extensively, living in Bali for several years, and visiting Cologne, Berlin, and Istanbul. Back in Seattle, he became Chef at Delicatus; started his own company, The Generous Chef and did pop-up dinners mostly outside of Seattle—New York, San Francisco, Santa Barbara, L.A.; was a private chef; and did some consulting on the side. He attended Willamette University, University of Portland, WSU, and culinary school in San Diego, and has his sommelier certification from the Court of Master Sommeliers. About: Originally from Guelph in southwestern Ontario, Canada, Chef Whiteside takes inspiration in local farm raised product and whole animal cooking. His seasonal menus and culinary offering is inspired by the Pacific Northwest’s local farmers, foragers and artisans. Chef Whiteside’s classic restaurant training has spanned both individual restaurants and hotels across Canada before he joined the Fairmont team in 2013. With Fairmont, Chef Whiteside has worked in kitchens from Canada to Bermuda to now Seattle. Utilizing his formal techniques he loves approaching dishes with free form delivery and whimsy, creating a true culinary experience with every dish. He is the Executive Sous Chef. About: Ba Culbert is Chef/Owner of Tilikum Place Cafe. With almost twenty-five years of experience working in Seattle kitchens for some local hospitality greats like Tom Douglas and Joe McDonnal, she will be celebrating Tilikum’s tenth anniversary in October. Chef Ba finds inspiration for her dishes from the fresh, local, seasonal produce of the Northwest, as well as from experiences traveling throughout Europe, Southeast Asia, and Mexico. About: Bill started working in the food service industry over 30 years ago, while attending high school. He washed dishes and prepped food. As an art major at Central Washington University, he was throwing pots and wondering what kind of art he was going to teach. But he had a knack for cooking and kept progressing, working in many different kitchens. In the summer of 1984, he was offered his first salaried chef job; he hung up the pencil and potter’s wheel, opting for the sauté pan. For over 20 years, Bill has been working with Duke's Chowder House, from Sous Chef, Head Chef, General Manager, Regional Manager, and now Corporate Executive Chef, which he’s held for 12 years. Prior to Duke’s, Bill held various leadership positions at restaurants such as Charlie’s, Quinn’s, Houlihan’s and Great Western Dining group. He is active in the community, and co-authored Duke’s new cookbook, “As Wild As It Gets” with Duke Moscrip, and has taught at the Art Institute of Seattle. Bill has lived in Washington state his entire life and married his high school sweetheart, Lisa. They have three children: William (26), Johnny (22) and Samantha (21) and live in Bellevue. About: Executive Sous Chef Brian Doherty has helped lead the culinary team at The Mark since March 1, 2017, now overseeing the creative and business side of food and beverage at The Sanctuary event space. Prior to that, he served as Executive Chef at Fairmont Newport Beach for four years. Chef Brian launched his career at The Four Seasons Seattle, and held progressive positions at the Fairmont Olympic including Chef de Cuisine and Executive Sous Chef. He held a temporary post at the Four Seasons Hualalai, Hawaii. His menus reflect not only their locale but the spirit of the area. During his free time, he enjoys snowboarding, playing the guitar and spendingn time with his family. About: Chef Daeng was the executive chef at the Imperial Hotel in Bangkok and opened a series of Thai restaurants in France for them. She came to Seattle in April 2001 to become the executive chef for Thai Food International. She played an instrumental role in the opening of Aloha Plates, Thai Go Express, and Thai Go Dining franchise chains, in addition to the ongoing creation of Racha Thai's fine dining menus. She is now the executive chef for Racha Thai and Asian Kitchen. About: After working through some of Seattle’s best kitchens over the past ten years, Daniel Cox has landed at Quality Athletics, working with Josh Henderson and Huxley-Wallace Collective. Originally from San Diego, Daniel has made a name for himself in Seattle by being well-rounded in everything from vegan cuisine to whole animal butchery and everything in between. Spaetzle (noodles) a L'Alsacienne, traditional to the Alsace region of France. Tossed with oven dried tomatoes, mustard greeens, lemon, caramelized onions and bacon and Comte cheese. About: A Seattle native, David spent a number of years traveling before eventually returning to the Northwest. 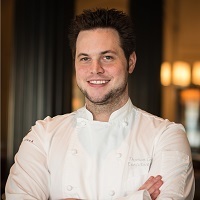 During his travels, he spent time in Chicago, where he held the position of chef de cuisine at HB Home Bistro and Executive Chef at Michelin recommended Bite Café. About: Chef de cuisine at Elliott’s Oyster House, Erika grew up with a grandmother who loved baking and hosting gatherings at her bed and breakfast in Phinney Ridge. Erika took an early interest in all things culinary with a primary focus on baking. Formulating ideas for school projects where restaurant and menu development were the topic, it wasn’t long before she began volunteering, and eventually working at Tall Grass Bakery in Ballard. She spent many years involved in the National Restaurant Association’s Prostart program teaching high school children the skills to build innovative dishes from start to finish. Before joining Elliotts 11 years ago, Chef Nelson worked at various other restaurants and bakeries including Daniels Broiler, Emory’s on Silver Lake, and Salty’s on Alki. Chef Nelson currently resides with her boyfriend Carey and their two daughters, Josefine and Violet in Lynnwood, WA. About: Leading the Tankard & Tun culinary team is Chef Gabe Spiel. Chef Gabe lives for the moment when a diner pauses after the first bite of their meal and looks curious. “I love it when people assume they know exactly what they’ll get from a dish and then are pleasantly surprised by a twist we’ve put on it,” says Gabe. Local pride in all our NW has to offer guides his menu, which will focus on in-season and locally grown and foraged food, complemented by our handcrafted beers. Gabe was born and raised right here in the Puget Sound region and started as a line cook in The Pike Pub at 19 years old. Rivaling his passion for cooking is his growing family and getting outside to ski, hike and fish whenever he can. About: Chef Mills graduated from the University of Washington, then began a career in the lobbying field. His love of food took over after a few years and he went to culinary school at the Art Institute of Seattle. He then became a chef instructor at the school. Harry joined Heavy Restaurant Group at Purple Café and Wine Bar in 2006. He was an integral part of Seattle's opening team, and was interim head chef before being promoted to Executive Chef of Heavy’s Bellevue restaurants including Purple Café, Lot No. 3 and Cast Iron Studios. In 2013, he returned to Purple Seattle as Executive Chef. About: Chef Maxfield grew up in Seattle and has an Associate’s Degree of Applied Science/Culinary Arts from South Seattle Community College. He began his career as a line cook at the Seattle Tennis Club. In Seattle, he worked at Canlis under Greg Atkinson, Chez Shea, and the Golf Club at Newcastle. He worked at The Five Palms Beach Grille in Kihei, Maui. Prior to coming to SkyCity, he worked with Southbridge Restaurant Group in Scottsdale, Arizona, opening the first of three full-service restaurants on the Scottsdale “waterfront” for entrepreneur Fred Unger. About: Matt Heikkila first pursued a career in computer science, but eventually found himself needing a more creative profession. After graduating college, Heikkila picked up cooking, found that creativity he was craving, and immediately fell in love with the craft. Heikkila’s passion for cooking grew, and he eventually turned his hobby into a career. He moved from Salish Lodge to Executive Chef at the Pan Pacific Hotel, and is now Executive Chef at the Embassy Suites flagship hotel in Pioneer Square. About: One of Chef Meredith’s missions is to demonstrate that it’s possible - and wonderful - to have healthy and flavorful on the same plate! Having worn the hats of pastry chef, food truck operator, private-school chef, farm hand, and corporate executive chef, Meredith currently brings her comprehensive background to the role of Culinary Content Manager at Sur La Table. She is a native Iowan who has lived in Seattle since 2002. Although initially pursuing a degree in Social Work, she found herself strongly drawn to the culinary world, and obtained a Culinary Degree from the Art Institute of Seattle as well as a certificate in Health and Nutrition from the University of Washington. Meredith also immersed herself in Seattle’s thriving and innovative restaurant world. She is delighted to bring her varied experiences to Sur La Table - and, tonight, to you! About: As a child, Chef Paolo lived in California, Japan and New York, then Seattle. His family opened several bakeries. As an adult, he made his way through many kitchens in Seattle. In 2004, he started his career at Salty's on Alki, moving from wood-oven cook, to sous chef, chef de cuisine and now executive chef. About: Chef Levine attended the California Culinary Academy in San Francisco and the Diablo Valley College Hotel and Restaurant School in Pleasant Hill, California. In San Francisco, he worked at Harry’s Bar and American Grill. On the East Coast, he worked at Twenty-One Federal Restaurant, and in Washington D.C,. he served as apprentice for the late Jean-Louis Palladin in the Watergate Hotel. In Seattle, he has worked at Trattoria Carmine, Isabella Ristorante, BluWater Bistro, Vivanda, and Mackay Restaurants Troiani and Waterfront Seafood Grill. He is now the chef for the Talaris Conference Center and Columbia Hospitality. RAW: Crudo | Ceviche | Spicy Sashimi. Three separate preparations and tastings. About: Executive Chef Southern grew up on a small farm just outside of Vancouver, BC surrounded by all things fresh from the garden. “I’m lucky I never had to choose a career. I walked into my first kitchen when I was 14 and I’ve been hooked ever since,” he says. After culinary school he completed his apprenticeship at the William Tell Restaurant, followed by a stint with Chef Bruno Marti at La Belle Auberge. From there he worked his way up to Executive Chef at Umberto Menghi’s Al Porto Restaurant in Vancouver’s Gastown District. He became an Executive Chef with Holland America Line, working on ships and experiencing global cuisines. He has worked for Westin Hotels and Resorts in Grand Cayman and St. Maarten in the Caribbean, and lived in Lima, Peru, for several years. Accolades include Chef of the Year, Grand Gold, 5 Gold Medals, and 1 Silver Medal at the Cayman Islands National Culinary Salon, Top Apprentice by Canadian Federation of Chefs de Cuisine, and an appearance with Team Canada at the World Culinary Exposition in Luxembourg. He has now returned to the Northwest, to Orcas Island and Rosario Resort and Spa's The Mansion restaurant. When he’s not cooking you can usually find him together with his wife and two furry dogs walking on a long peaceful trail or playing a good game of fetch in the dog park. Tart with pastry cream and fresh berries to decorate! About: Salty’s on Alki’s Pastry Chef Tarah Kirit graduated from Le Cordon Bleu Culinary Arts of Seattle with a passion for teaching individuals about the art and technique of baking. Throughout high school, she was involved in Arts and Humanities and it led her to the idea of making food art. She loves making things that cause people to ask, “How did you do that?” and loves even more so the expressions on peoples’ faces when they take a bite of her food. She grew up in Los Angeles with a mother who is a great cook. Tarah would make desserts to complement her mother’s meals. Her favorite thing to bake is French macarons; she has developed her own recipe over a two-year period. About: Born in North Bend, Taylor made his way to Cle Elum at an early age. Growing up in the Northwest and the foothills of the Cascades, he spent hours outdoors. Summers were spent mountain biking, fishing, playing football, and then as an after school job at the age of 14, cooking. By 18, he knew it would be his career. In 2005 he had a full-time job cooking at Suncadia in the INN, steps from where he currently is at Swiftwater Cellars. He then worked at Salish Lodge, where honed his skills. But his heart was in Cle Elum and he returned in 2011, moving into the kitchen at Swiftwater Cellars. About: Chef Thomas Griese has spent a number of years with the Michael Mina group, working closely with Mina, and taking off at a moment's notice to help out at one of the many concepts or open a new concept or location. Seattle's RN74 opened in 2011. Griese arrived in 2017 with the intention of putting down some roots. In the past, he staged at the French Laundry, then worked again with Thomas Keller in Las Vegas at Bouchon for two years. Griese believes in the balance of flavors and loves the ingredients that can be found in the Northwest. At RN74 you'll find elevated dishes as well as a good burger and beer at the bar. About: A Kentucky native, Chef Johnson grew up as an “army brat” and traveled extensively. He began his culinary adventures in high school working as a dishwasher and prep cook, and continued cooking while studying accounting and business at the University of Northern Colorado. He has worked at the Renaissance Parc 55 Hotel in San Francisco, the Marriott Hotels and Resorts in California and Colorado, and Andaluca and Oliver's Lounge at the Mayflower Park Hotel in Seattle. In 2012, he became the executive chef at Ray's. In 2015, he was named Executive Chef for FareStart, then Corporate Executive Chef. Chef Wayne has earned many accolades, including being selected as a “Rising Star” by StarChefs.com and Iron Chef America Season 9 Challenger. Although it rarely happens, chefs are subject to change.